Is it Time to Buy Deere & Co.'s Stock? An in depth look into whether or not John Deere's stock is a buy. Agricultural and construction machinery manufacturer Deere (NYSE:DE) represents one of the most compelling investment ideas in the industrial sector right now. However, it's not going to be an easy decision for you. The long-term demand for food (more than 80% of Deere's sales are in its agriculture and turf segment) remains in place, but the company also faces significant near-term risks from declining food prices. What's an investor to do? Before focusing on answering this question, readers may be interested in referencing other articles in this series. For example, a review of the recent results here highlights the deterioration in the company's agricultural sales; a review of the five key takeaways from the earnings conference call can be found here; and articles making the making the bullish and bearish cases for the stock can be found here and here. Turning back to question in my lead, the answer is "no" and "yes." No one said buying and selling stocks was easy! The answer is only positive provided you can stomach near-term risk, and Deere undeniably has significant short-term issues. Similar to rival Caterpillar (NYSE:CAT) in the construction machinery sector, Deere is forecasting 10% growth in its construction equipment sales this year. However, on the main side of Deere's business, things aren't looking so rosy. Crop prices are declining, and the company recently lowered its full-year sales and net income guidance as a consequence. Deere also reduced its forecasts for key crop prices, such as wheat and corn, in 2015. On top of this, ensuring its products comply with Tier 4 emissions standards is likely to put downward pressure on margins next year. Things could get a lot worse for Deere in the near future, and investors shouldn't expect a positive narrative from its management anytime soon. Indeed, rival company AGCO (NYSE:AGCO) reported sales fell 10% in its second quarter and also lowered its industry outlook across all its regions. Indeed, the most obvious upside driver to performance in 2015 -- some bad crop growing conditions that cause an undersupply of crops and soaring prices -- would likely be met with a short-term negative, as commentators rush to worry about short-term sales to farmers affected by poor weather. However, resulting higher crop prices would be a net positive to Deere in the long term. All told, the near-term risk is piling up for Deere. This isn't a stock to buy if you don't like imminent volatility, or if you think you can time an entry point better. Is Deere a long-term buy? Another perspective is that this is exactly the time when you should be buying. In other words, the market has become pessimistic about Deere's prospects, and any positive news will lead to upside in the stock. 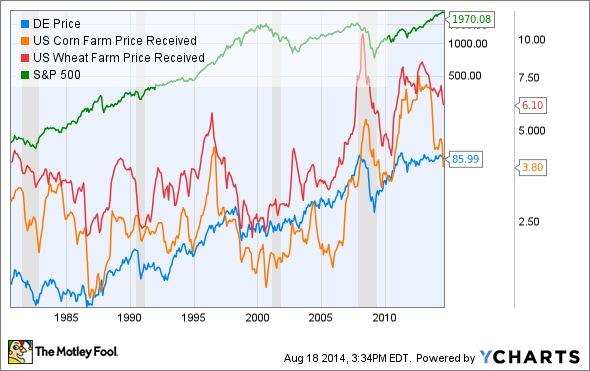 Moreover, a previous article noted that Deere stock is not particularly expensive on a historical basis. Furthermore, one of the key attractions with the stock is that its end-market drivers are related to the agricultural industry rather than the economy at large. The two do not necessarily move in the same direction. The following chart demonstrates that Deere's price movements tend to follow the trend of prices in key crops such as wheat and corn. Note that in the recession in 2001-2003, Deere's stock price actually did quite well even as the main index fell significantly. Many investors will find this kind of diversification attractive, and it's not easy to find such stocks in the marketplace. Don't buy Deere unless you can tolerate near-term risk. There is definitely the sense that the company would be challenged to hold on to margins and pricing if the agriculture market continues to decline. However, if you can take a long-term view, then the company offers a lot. Farmers may be behaving conservatively, because crop prices are falling, but this isn't 2008, when credit was harder to obtain and crop prices fell dramatically. Plus, crop prices shouldn't go down indefinitely and the demand for food is surely going to increase over time. If you don't believe in timing an entry point into a stock, then Deere is worth picking up, especially for the diversification it brings to your portfolio. However, for those willing to play the waiting game, the stock could get cheaper in the near term. Either way, it's a stock worth following closely.